In 1811 the National Society for the Promotion of the Education of the Poor in the Principles of the Established Church, more familiarly known and the National Society for Promoting Religious Education, was formed. Their intention was to encourage the provision of a church school in every parish in order to provide the poor children with a basic education. By 1816 the vicar of Goudhurst, the Reverend William Bagshaw Harrison, had founded such a school in Goudhurst – one of the first National Schools in Kent. The records kept by the Master, William Stevens, show that the number of children on the register rose from 51 in 1818 to 172 in 1822. At that time the school was based in two hired rooms (whereabouts unknown) which were no longer suitable as accommodation. Consequently, Harrison contacted the National Society for financial help for a new school to be built as there was a requirement for cheap instruction for “not less than 400”. The school was to be supported by a subscription from local parishioners and there was to be a weekly payment of one penny a week for each child. Although they initially refused, Harrison persisted and in 1824 the society approved a grant of £120 to build a new school with two rooms, one above the other. It became known as Clay Hill Mount School. The numbers attending the school continued to rise; at one time as many as 300 children from all parts of the parish attended. The pressure on the school and its facilities was finally eased when an infant’s school was opened at Brandfold in 1844 and again in 1846 when Viscount Beresford built a school for the children of Kilndown. In 1870 the government took on the responsibility of education, imposing a School Board when existing schools did not meet the required conditions, i.e. having a certified teacher and suitable premises. To avoid the imposition of a School Board Goudhurst inhabitants set about raising the funds required to build a new school. With the aid of grants from the government, local subscriptions and the sale of the Clay Hill Mount school enough money was raised to build a new school for 70 boys, 80 girls and 100 infants, plus two houses as accommodation for a Master and a Mistress. Built on the site of the old Grammar School the new school was officially opened on 17th of April 1875. In the following years the school log books record the usual ups and downs of school life, including absenteeism due to illness and the employment of children during the haymaking and hop-picking seasons. It is not surprising that a school inspector in 1885 declared that the standard of attainment was not high. Little seems to have changed in the succeeding years as in 1936 a similar situation including poor staffing was also a cause for concern. 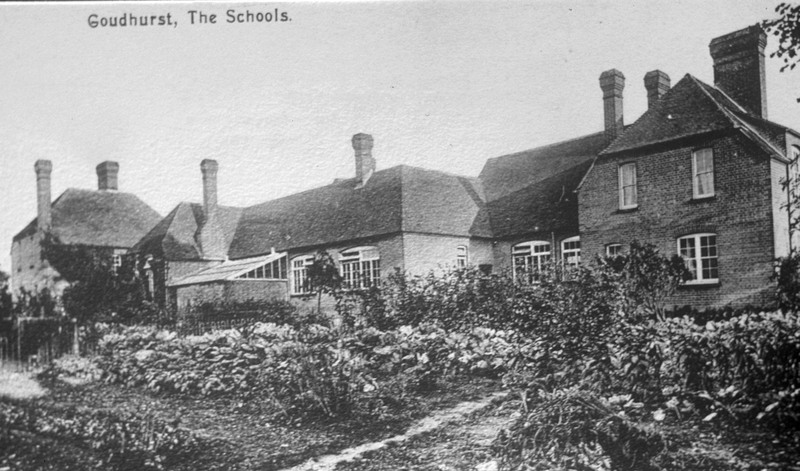 Between 1939 and 1944 the school numbers were expanded when children from Woolwich and Beckenham were evacuated to Goudhurst and both the Parish Hall and the Church Room were used as classrooms. In 1942 most of the evacuees returned to London and in 1943 many Goudhurst children were evacuated to Somerset. In 1950 when the 1944 Education Act, which provided for secondary education for all, came into force the older children left the school join Secondary schools elsewhere and the school became a junior and infant mixed school. Over the next 40 years many improvements were made to the school buildings and in 1991 the school was renamed Goudhurst and Kilndown Church of England Primary School. In 1998, a new Primary school was opened on the site on the Cranbrook Road and the old school was demolished.